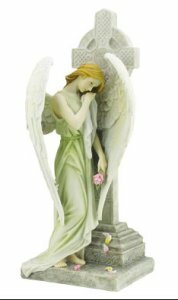 DIVINE CHRISTIAN GIFTS - Angel Cross Statue 12" by Veronese. Inspired by the Italian renaissance artist Palo Veronese 1528 – 1588. Each Veronese statue is hand painted.